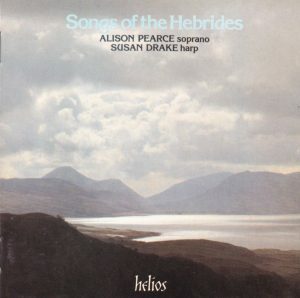 “Songs of the Hebrides”? Where are “The Hebrides”? Isn’t that one of those mythical lost continents, like Atlantis, submerged under the tidal waters? Beg your pardon? Oh, no, they are the remote and isolated islands north east of Scotland? Oh, okay then. But just wait, with global warming and the elevation of the sea levels, it’s only a matter of time. I’ve just posted a lengthy review of a companion recital by the two same performers, soprano Alison Pearce and harpist Susan Drake, devoted to Haydn’s Welsh folksong arrangements. What seemed would be a quick and short review of an inconspicuous disc of pretty and sweet but unsubstantial music turned out to entail hours of online research, just to establish what exactly were those versions for soprano and harp that they performed, in relation to Haydn’s original arrangements. No such need here. The liner notes are clear and informative about the role of musicologist and folksong researcher Marjory Kennedy-Fraser (1857-1930 – link will open a new tab to Wikipedia article) in the early 20th century in collecting and publishing those songs (four volumes from 1909 to 1924, say the notes, in fact apparently five volumes with the last from 1929 – more about that below), and about the fact that those publications came with accompaniments for piano, most provided by Mrs Kennedy-Fraser herself (without ever, she claimed, altering the original melodies), a few by composer Granville Bantock, that in turn Susan Drake plays at the harp – as she would two years later with Haydn’s harmonizations of the Welsh folksongs. So I can jump directly to the conclusion: the music is pretty and sweet, with a welcome alternation of the wistful /plangent / longing / mourning / loving and loving forlorn, and the more martial / heroic / triumphant. Kennedy-Fraser’s accompaniments are no mere hack job, and some of them are wonderfully imaginative. If Britten is called the composer of his folksong arrangements and even Tippett credited as the composer of his Purcell-realizations (which are no more than realizations of Purcell’s figured bass), then Kennedy-Fraser deserves to be credited as well as the composer of these folksong arrangements. A few recordings she made, that you can hear on Archive.org or on YouTube, show that she was no hack pianist either. Played at the harp, her piano accompaniments are lovely, and Pierce’s small but pure soprano voice is charming. The songs are simple, maybe a little too uniformly so to be entirely substantial, although songs like “Spinning Song” (track 4), “Kirsteen” (16) or the eerie “The Uncanny Mannikin of the Cattlefold” (track 20) go beyond that – the latter could be right out of Britten’s The Turn of the Screw. The concluding song, “The Death Farewell”, is also a beautiful funeral lament – may be simple, but very effective and moving. 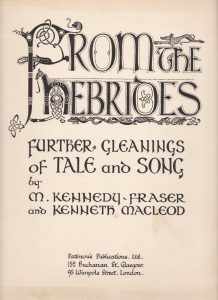 The only regret is possibly that the songs are sung in the (excellent) English translation provided in Kennedy-Fraser’s scores (most by herself, some by Gaelic poet and scholar Kenneth MacLeod – on the back cover Hyperion misspells his name McLeod), although, in the scores, Fraser always provided the text in its original Gaelic language also. Some shards of that original language remain in a few of the songs selected by Pierce and Drake, making one regret that they didn’t sing them all in those strangely and fascinatingly alien sounds, remnants of the language of the elves and fairies. The LP was originally published in 1981 on Hyperion A66024 but (unlike the artists’s Haydn Welsh folksongs recording) never reissued on Hyperion’s full-price series. This reissue on their mid-price Helios series was made in 1989. There is also another companion CD of Irish songs by Pearce and Drake, Hyperion-Helios 88023 “My Lagan Love and other songs of Ireland”, barcode 034571180236. 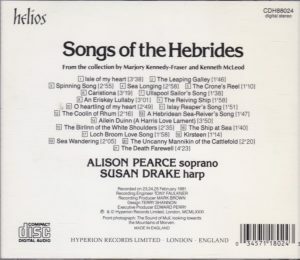 I see also that in 1997 Hyperion recorded another recital of Kennedy-Fraser’s Hebridean songs, also accompanied by harp, and with a number of duplications with the songs selected by Pierce and Drake: “Land of Heart’s Desire: songs of the Hebrides from the collection of Marjory Kennedy-Fraser” by Lisa Milne (soprano) and Sioned Williams (harp). Hyperion CDA66988 (1997), barcode 034571169880. 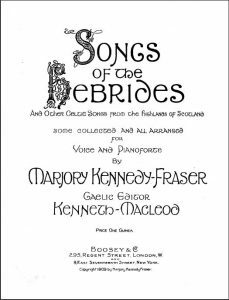 In fact, I see from the booklet, available on Hyperion’s website, that even the liner notes have been borrowed from Pierce and Drake, but with the not insignificant factual correction that now six books of Hebridean songs are attributed to Kennedy-Fraser, from 1909 to 1927. I’m partly doubtful, though. I wonder for instance if what annotator Edward (in 1981) / Ted (in 1997) Perry (incidentally, he was the founder of the label Hyperion; he passed away in 2003) refers to as the “1913” publication isn’t the score of 12 songs selected from volume 1 that was published in 1914 and that’s also on IMSLP (the book doesn’t bear a copyright year but the foreword by Kennedy-Fraser is dated 1914). 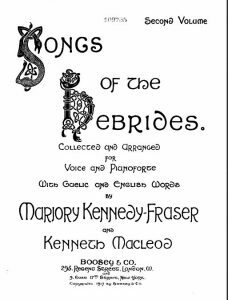 Or it might be the score of “Sea-Tangle: More Songs of the Hebrides”, a pre-selection, published indeed in 1913, of nine songs from the volume 2, then in preparation. Also, Boosey’s 1917 publication is called “volume 2” (see photo) – and it would have been “volume 3” if there really had been an autonomous 1914 publication. Finally, the foreword of Further Gleanings of Tale and Song, the vol. 4, starts with the words “when in 1921 was brought out our third volume of ‘Songs of the Hebrides’, I fancied I had finished work in the field which has occupied me now for twenty years. But a recent visit to Barra, in the Outer Isles, and frequent visits to Skye and to Gigha have resulted in the netting of such a shoal of fresh airs, that we are perforce obliged to add this fourth volume”. Obviously the 1913 and 1914 publications cannot be considered as separate volumes, they are only excerpts from vols. 1 and 2. As for this fourth volume, again there is no copyright indication, but Kennedy-Fraser’s foreword is dated “1st October, 1925”, which is compatible with Perry’s indication of a volume from 1925. Remains then what Perry titles “More Songs from the Hebrides” and dates 1927. Well, that volume is indeed attested, for instance on the catalog of the British Library, or on the catalog of the Australian libraries; there’s even an entry (but no offer at the time of writing) on Amazon.uk, but it is titled “More Songs of the Hebrides” and dated 1929. I haven’t been able to find its table of contents. Texts (English) provided, TT 53:23. And it turns out that this was again a long review involving quite a lot of research.